Ryan bids a fond farewell to a great season, and makes as many fireworks as possible, as one should. Chief among them: His choice for Player of the Season, which is of course 100% correct. Deal with it. Ryan negotiates his way through the twists and turns of a convoluted but ultimately shocking final boot before the David vs. Goliath finale. Chock full of tricks, frenemies, revenge, God, and of course... balls. Ryan ponders the relative merits of going Big (Move) AND going home, crapshoot (lack of) movement to win reward, not moving at all to win immunity, and hiding your movements so as not to become a target, as seen in Episode 12 of David vs. Goliath. Ryan looks back on two hours of David vs. Goliath that delivered in so many ways: yoga, tips, dunks, drunks, Godfathers, drunk Godfathers, eggs, and dings. Or possibly bings, depending on your perceptions. Episode 9: Do you like surprises? Ryan recounts his shock and awe at the advantage avalanche the Davids pulled off in blindsiding Dan, but also his love of burger atmosphere and perchance, a hint of a new honorary Wanner? Ryan navigates the twists and turns of an episode that was all about Christian, but really only as a distraction in order to pull off an epic idol-aided blindside. With as many sandbags, pizzas, Culpeppers, and Dan pleases as you can handle. Three tribes become the singular (but double-named) Kalokalo tribe, and Ryan Kaiser is here for the merge shenanigans, mostly involving various Goliaths strong-arming each other, but also double (triple?) agents, art, and seagulls. Ryan searches for meaning in a post-Natalie David vs. Goliath world, and finds some seeds of post-merge hope (even if it's not a strategy): A more villainous Angelina, a descent into madness on Vuku, a potential successor to James, and an entire tribe of Debbie-worthy balance beaming. It is a dark and tumultuous time as Ryan endures a heavy, wrenching blow: The loss of Queen Natalie, long may she reign. Also some cyclone wrecks the camps, or something, idols are found, challenges won, jackets argued over, yada yada. Ryan reviews a movement-packed episode, as Bi leaves, tribes swap, something called Jabeni appears, Natalie ascends to her throne, Carl finds a strange new power, Tiva loses immunity, Alec flips, and Natalia is blindsided. Phew! But at least she takes it in stride. Ryan relishes every hair-flipping moment of the title bout in this episode: No, not Mason-Dixon vs. Gabby, or Bi vs. her knee, but Goliath vs. Goliath, a.k.a. Natalie vs. Jeremy. Episode 2: Why would you wanna take out the old lady? Ryan surveys the damage of two storms that swept through Episode 2 of David vs. Goliath: Elizabeth's high-powered flipping of the votes on David to save Lyrsa, and Natalie's cyclonic path to deepest reaches of his heart. Ryan basks in the extended space of the David vs. Goliath premiere, exulting in the extra time to meet and greet the new contestants, from the John of many names, to the Davids of many sad backstories, to sad back story of Pat, to the force of nature that is Natalie. 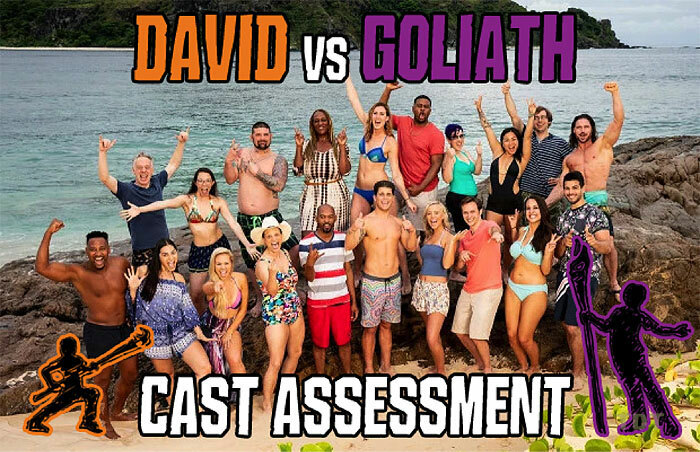 With just over a week until the premiere, Ryan kicks off our Survivor 37 coverage with his impressions of the new contestants of Survivor: David vs. Goliath, some of whom actually have some pre-season content beyond their written bios!